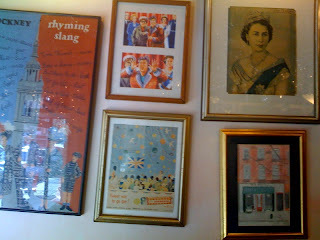 A bit of England at 108 Greenwich Avenue at Tea & Sympathy. 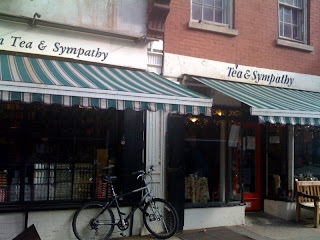 Tea & Sympathy also has a shop next to their restaurant that sells items imported from England. 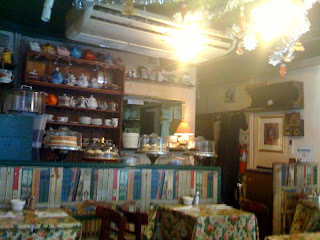 The restaurant is a tiny space with about a dozen small tables. And it's always busy here. In addition to their in-your-face reminders of England, all the waiters have the great British accent. The staff is friendly (our waitress with the curly red hair was especially great) and there's a waitress (or perhaps manager) that reminds us of a British Axl Rose. They don't sell alcohol here but you can buy beer like Guinness two doors down at Salt & Battery and bring it back to Tea & Sympathy. Tea and Guinness - a bit of an odd couple but it works, especially when food is involved. Thier afternoon tea come with your choice of three sandwiches (I chose egg salad, chicken curry, and cheese and Branston pickle), scones with clotted cream and strawberry jam, banana cupcake, and chocolate cake. Comes with a pot of tea of your choice. Everything was good. But their mushroom Shepherd's Pie special was just so so. 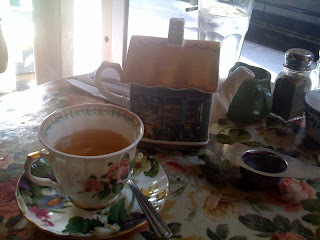 Tea & Sympathy's other menu items include steak & Guinness pie, bangers and mash, chicken & leek pie, tweed kettle pie, lentil casserole, scotch egg, Welsh rarebit, roast beef and Yorkshire pudding, and cornish and onion pastry. And their tea selection is excellent.